The latest issue of Technology&more has been released by Trimble. Read the latest edition of Technology&more here. The Trimble Indoor Mobile Mapping Solution (TIMMS) is the optimal fusion of technologies for capturing spatial data of indoor and other GNSS denied areas of all sizes and locations. It provides both LiDAR and spherical imagery of a facility, enabling the creation of accurate, real-life representations (maps, models) of interior spaces and all of its contents, every object in the interior space all at speeds not possible with traditional laser scanning techniques. TIMMS truly revolutionises indoor 3D mapping, enabling high-end productivity to give your business the winning edge in indoor mapping. Recent earthquakes have prompted an update to the iBASE network and you must complete a GNSS Calibration to ensure it is accurate. On November 14th the Upper South Island experienced a 7.8 magnitude Earthquake which is now widely known as the Kaikoura Earthquake. The resultant movement has impacted stations as far north as Hawkes Bay and as far south as Waitaki. The Kaikoura earthquake also appears to have triggered a slow slip event (SSE) on the east coast of the North Island. This is affecting the Hawkes Bay PositioNZ and iBASE network coordinates. Given the significance of this seismic event, we have updated the coordinates nationwide to bring all reference stations in the iBASE network to a new epoch as of January 1st, 2017. 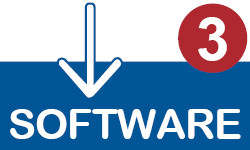 This is an update to the current iBASE service, the IP address used to connect to the service does not change. However please note that there are important steps you must take to ensure you experience an optimal performance of the iBASE network, primarily that when you first connect to the iBASE service after the coordinates have been updated, you MUST complete a GNSS Calibration before doing any field work using the iBASE service. This applies to users of Survey equipment as well as machine control systems. In keeping with standard naming conventions each correction stream will have Y16 replaced with Y17 as that is the new epoch date. Full Nationwide iBASE coordinate adjustment. New EPOCH date for all stations is based on a January 1st epoch. New Calibration will be required as of December 12th. Have you ever arrived at a site you need to scan only to find it behind a locked gate and then had to track down the operator to get the key just to do your job? This was a common problem for Devin Kowbus, Survey Department Manager at CH2M, who commonly surveys oil and gas facilities. Frustrated by the lack of productivity this caused, he started using their Trimble V10 to survey from outside the fence. They then use the V10 imagery to “survey without actually surveying” and processes it in the office, picking and choosing what is needed for their client. Hear the full story in the video below. Tried and tested, Trimble’s MultiTrack technology has been on sites around the world for over 10 years and there is still simply nothing else on the market to rival it. This is because unlike other manufacturers, Trimble tracking does not rely purely on the reflectiveness of the target, it’s much more sophisticated than that. 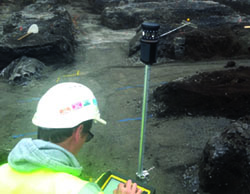 The success of Trimble MultiTrack technology is a direct result of the introduction of robotic total stations (RTS), first introduced to us by Geodimeter (later to become a part of Trimble) over 25 years ago. A total station may be called robotic if it is able automatic­ally to follow a prism moving through 3D space. 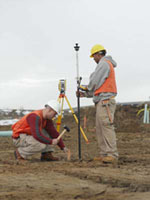 Key to this feature is the communication link between the total station and prism pole. All RTS, from all manufacturers, come equipped with servomotors for automatically rotating the instrument horizontally and vertically, and an Advanced Tracking Sensor (ATS) for tracking the prism, so how can we differentiate between the performance of one RTS and another? When surveying with an RTS, it is more important than anything else to ensure reliable and robust target recognition. Typically on site we have lots of reflective objects like traffic signs, reflectors on safety vests or number plates and more likely than not, several prisms and targets are also in use. If we could measure only on “unidentified” (passive) targets, the surveyor would constantly be running the risk that those reflective objects would interfere with each other and cause a loss of target or a wrong target lock. Tried and tested, Trimble’s MultiTrack technology is 10 years old and there is simply nothing else on the market to rival it. This is because unlike other manufacturers, Trimble tracking does not rely purely on the reflectiveness of the target. Instead it uses a unique target ID system which identifies the prism using a modulated infrared light wave. Before measuring a point, Trimble Access field software can be set up to check the target ID and make sure the right prism is locked. Up to eight active targets can operate simultaneously on the same site with no risk of tracking the wrong target, ensuring accuracy and completeness of work with no loss in productivity due to false target lock. Some instruments on the market have a function called ‘self-learning’ in the form of a scanning function whereby you can do several scans to discount reflective surfaces. However, you need to cover the prism to exclude it from the scans and also nothing has to move during the process – an unrealistic situation on a busy site. This process therefore not only takes time but engenders a false sense of comfort because it works on the flawed principle that nothing within the environment moves. Where does that leave the surveyor surrounded by workers in high vis. clothing? The ‘self-learning’ approach tells you what to exclude, the Trimble approach tells you what to include! The ActiveTrack 360 target was designed to provide a smaller, lightweight target for optical surveying utilising Trimble’s industry leading active tracking technology. ActiveTrack 360 target is an active-only device and therefore contains no glass prisms. Eliminating the prisms provides for a smaller, lighter weight target, while maintaining robustness and measurement accuracy. It also offers Trimble’s new eBubble function – an electronic bubble displayed on the controller. This means you only have one place to look, which is especially useful when the pole bubble is hard to see. Connecting to the target via Bluetooth, allows the operator to see the plum of the pole on the handheld controller. This allows for better accuracy, especially when surveying in hard to reach areas or setting out using a short pole or point. The Trimble MultiTrack target provides versatility to track both active and passive targets. Up to eight active targets can operate simultaneously on the same site with no risk of tracking the wrong target, ensuring accuracy and completeness of work with no loss in productivity due to false target lock. In short, the Trimble MultiTrack target is suitable for use with all Trimble S-Series robotic total stations and provides fully coaxial passive and active tracking via an integrated 360° prism ring and 2 active 360° LED rings. The active LED rings support the selection of a unique ID to ensure that 8 different targets can be operated on a single site with full confidence that the correct target is always used. Contact your local office if you would like to learn more about Trimble MultiTrack targets. This article was originally posted on www.KorecGroup.com and has been reposted with permission. The INTERGEO geospatial conference in Hamburg last week has seen our partner business Trimble add some exciting new solutions to their offerings. Full total station technology plus a high-precision scanner in one revolutionary machine. High-speed 3D laser scanning with value-for-money to deliver essential performance and scan quality. Ultra-high speed 3D laser scanner with no compromise on range and accuracy to deliver unsurpassed performance and versatility. If you would like more information about any of these products, contact your local AllTerra office or email info@allterra.co.nz. Trimble Kenai Rugged Tablet Computers: Mobile computers that are built tough. Kenai® Rugged Tablet Computers provide a large 10.1″ full-colour WUXGA sunlight readable display screen and Microsoft® Windows® 10 Professional operating system. It is fully rugged at IP65 and MIL-STD-810G standards. The Kenai tablet is ideal for mobile workers who need to utilise large forms and colour-coded information such as technical illustrations and is rugged enough to last for years of use even in harsh conditions. It meets the tablet computing needs of businesses in natural resources, utilities, transportation, agriculture, public safety, surveying, construction, mapping, field service, utilities, and other outdoor or service-related fields. 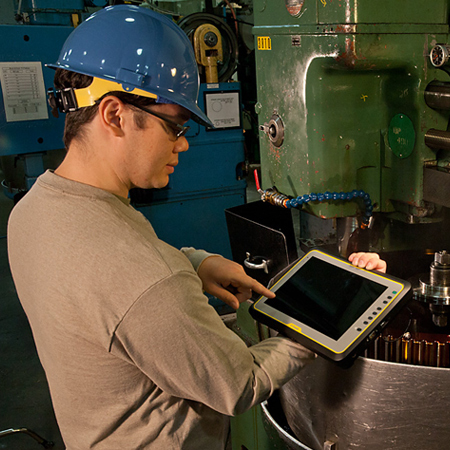 Find out how the Kenai rugged tablet computer can help your business by contacting us today! The Trimble TX8 delivers the power and flexibility to tackle even the most demanding projects. Designed for high performance, it enables you to complete 3D scanning projects faster than ever with unmatched speed and accuracy. The Trimble TX8 is the only scanner available with an effective scan speed of one million points per second. The Trimble exclusive Lightning technology enables you to scan at ultra-high speed while maintaining accuracy over the entire scan range, to deliver the best performance in the industry. Trimble TX8 data loads directly into Trimble RealWorks to colourise scans, register, manage, analyse, model, publish and deliver. Learn more on the special Trimble 3D Scanning Solutions site. The Trimble TX6 is a cost effective solution with superior performance over similarly priced scanners. The Trimble TX6 has an effective scan speed of 500,000 points per second and the Trimble exclusive Lightning technology enables high accuracy over the entire scan range. TX6 speed and accuracy make it the most productive scanner in its class and it’s built to operate in the most demanding environments. Designed for high performance, the TX6 enables you to effectively complete 3D scanning projects with superior speed and accuracy. Trimble TX6 data loads directly into Trimble RealWorks to colourise scans, register, manage, analyse, model, publish and deliver.